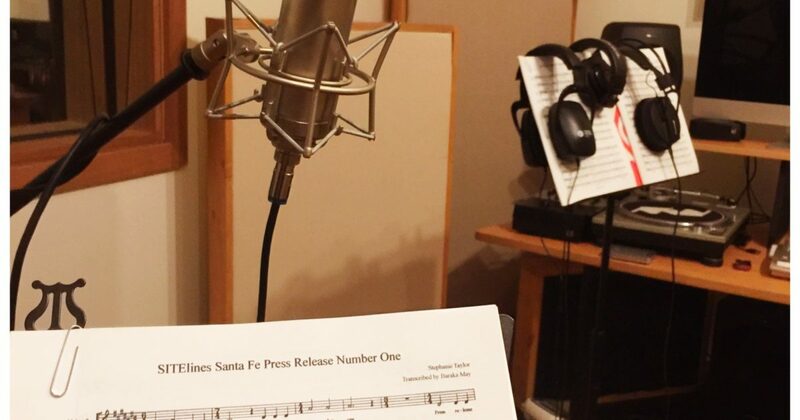 Photo: Recording of ​Stephanie Taylor's "Casa tomada Press Release Song #1​," Stones Throw Studios, Los Angeles, August 2017. SITE Santa Fe is pleased to announce the participating artists and new commissions for the upcoming SITElines.2018 Biennial opening on August 3, 2018. This is the third installment in SITE Santa Fe’s reimagined biennial series with a focus on contemporary art from the Americas. The exhibition features 23 artists from eight countries and ten new commissions. SITElines.2018 artist Stephanie Taylor announces the artists through the second in the series of commissioned songs, Press Release #2. Listen below. * Lutz Bacher (b. Berkeley, CA; lives in New York) Bacher will be creating several new works for the exhibition, including a large-scale work on the side of the building. Ángela Bonadies (b. 1970 Caracas, Venezuela; lives in Madrid and Caracas, Venezuela) and Juan José Olavarría (b. 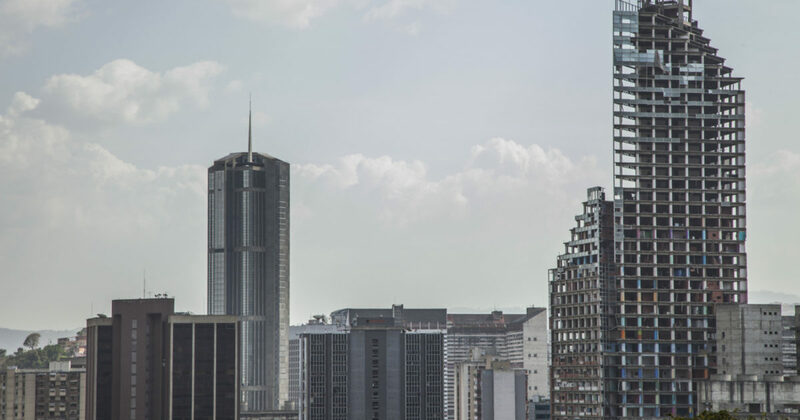 1969 Valencia, Venezuela; lives in Buenos Aires) Since 2010, the artists have developed work in different media for their ongoing project La Torre de David [David’s Tower], which focuses on the squatting (between 2007 and 2014) of a bank’s unfinished high-rise tower in Caracas. Paz Errázuriz (b. 1944 Santiago, Chile; lives in Santiago, Chile) The exhibition features Nomads of the Sea (1996), a photographic history of the last full-blooded Kawésqar people in the Western Patagonia, and a new series produced by Errázuriz in collaboration with Sergio Parra. Victor Estrada (b. 1965, Los Angeles; lives in Los Angeles) Estrada’s paintings offer a dense and textural interpretation of the landscape he annually traverses driving between Los Angeles and El Paso. Disorienting skies, unsettling atmospheres, recognizable fragments and figures clashing against the “American landscape” set the tone of these thick, almost modeled paintings. Andrea Fraser (b. 1956, Billings, MT; lives in Los Angeles) Andrea Fraser’s participation focuses on her new book, 2016 in Museums, Money, and Politics, which documents the reported political contributions made by trustees of more than 125 US art museums in the 2016 election cycle and its aftermath. Fraser extracts data from her book to design an installation to greet visitors in the lobby of SITE Santa Fe. *Hock E Aye Vi Edgar Heap of Birds (b. 1954, Wichita, KS; lives in Oklahoma City) Edgar Heap of Birds will present an installation of 48 blood red mono prints and their ghosts, titled Surviving Active Shooter Custer (2018). 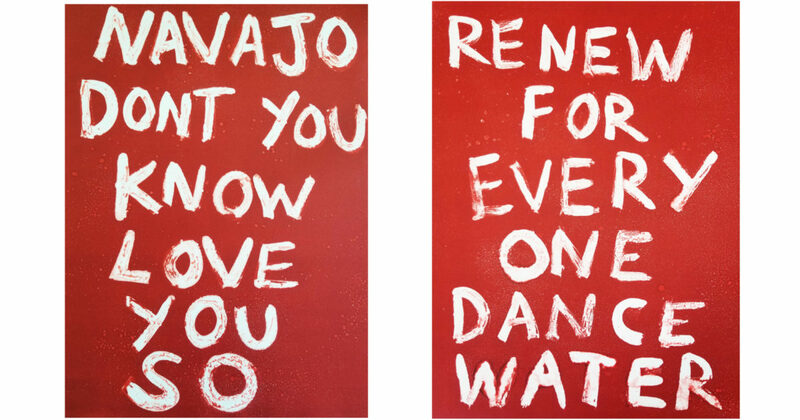 The spirit of these works originates from the ongoing Cheyenne survival of the 1868 Washita Massacre, led by Colonel Custer and U.S. armed forces in Oklahoma and contrasts this with pop music lyrics and recent military invasions. *Fernanda Laguna (b.1972 Buenos Aires, Argentina; lives in Buenos Aires) Using paper and cardboard, Laguna recreates the walls of a house where several of her actual paintings are hanging. 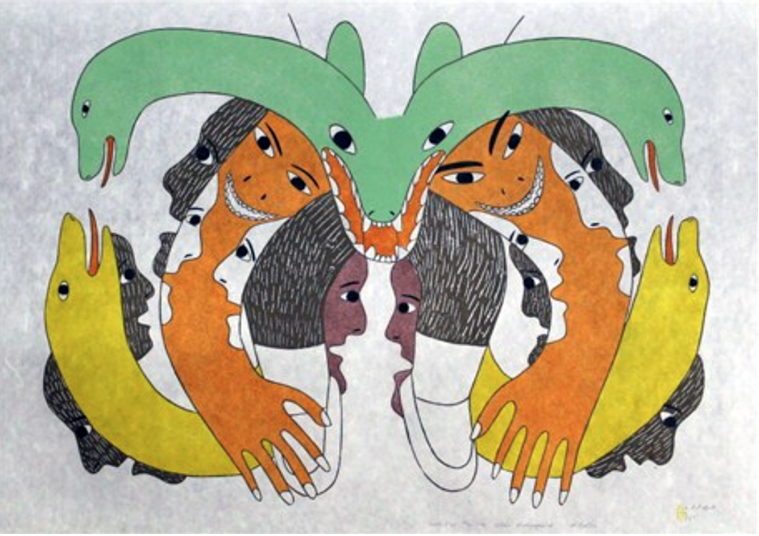 Victoria Mamnguqsualuk (b.1930 – d. 2016; Baker Lake, Nunavut Territory) Mamnguqsualuk created drawings, embroidered textiles, prints and sculptures over the course of her long career that depict Inuit mythologies and oral tradition. Her works express transformative relationships between people, animals, and the spirit world, influenced by her early migratory life in the Arctic. The exhibition will present some of her most iconic works. Jumana Manna (b.1987 Princeton, NJ; lives in Berlin and Beirut) Manna will present her new film, Wild Relatives (2018), which follows the complexity of a withdrawal of seeds from the Svalbard Seed Bank situated between Norway and the North Pole, and their journey to the Bekaa Valley in Lebanon, and the occasion’s global implications. This will be the first time the work will be shown in an exhibition in the United States. *Eduardo Navarro (b.1979 Buenos Aries, Argentina; lives in Buenos Aires) Navarro will create a new site-specific interactive sculpture in the Railyard park adjacent to SITE Santa Fe. A 1:1 replica of NuMu’s idiosyncratic egg-shaped building – formerly an egg sales kiosk – will travel from LACMA in Los Angeles to Santa Fe, where it will be installed in SITE’s front lobby. Throughout the run of Casa tomada, NuMu will house two exhibitions starting with a new version of Radamés “Juni” Figueroa‘s El Nido Salvaje, Salvaje [The Wild, Wild Nest], a project developed by the Puerto Rican artist for NuMu first in 2013 and re-iterated for SITElines.2018 on view from August 3 – November 25, 2019. NuMu’s second exhibition features Hildegarde Duane and David Lamelas‘ installation entitled, The Dictator, 2018, which is on-view from December 2018 – February 2019. This exhibition consists of two films, The Dictator (1978) and Smart People (1991), viewable from outside the egg-shaped structure. Each film, despite their humorous overtones, critically examine serious concerns regarding Latin America’s history of military dictatorships and the US complicity in maintaining it. *Tania Pérez Córdova (b. 1979 Mexico City, Mexico; lives in Mexico City) She will show a group of sculptures that engage in processes of exchange, as well as indicate absences and presences of people and places. She is also creating a new set of paintings that follow this thematic in her work. Jamasee Pitseolak (b.1968 Cape Dorset, Canada; lives in Cape Dorset) Pitseolak is at the forefront of a new generation of Inuit artists. Pitseolak works in customary materials, including stone, antler and ivory; yet his subject matter is distinctly contemporary and infused with humor and sculptural puns. *Naufus Ramírez-Figueroa (b. 1978, Guatemala City; lives in Berlin & Guatemala City) The point of departure of Ramírez-Figueroa’s commissioned project for the biennial is an early passage from the Popol Vuh, the Mayan book of creation, in which domestic objects rebel against the ungratefulness of humans. *Eric-Paul Riege (b. 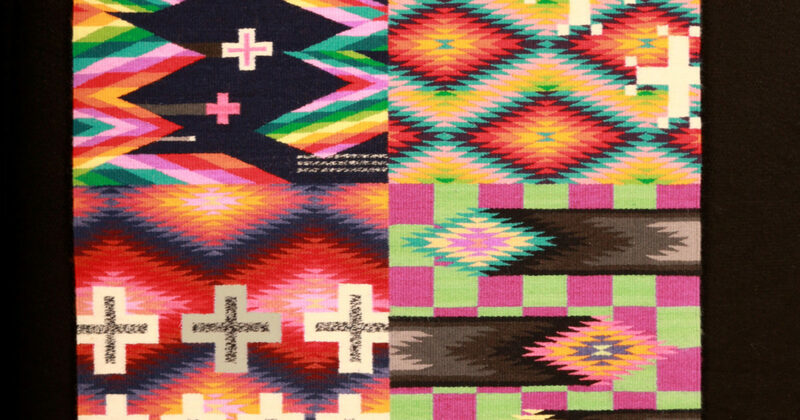 1994 Gallup, NM; lives in Gallup) Riege’s new installation will consist of regalia, photo collages and eight large looms, which he uses to recreate the ancient dwelling of Na’ashjé’íí Asdzáá(Spiderwoman),the Holy person who taught Diné people to weave. Riege will also premiere a new performance during the preview days that will embody the motions, gestures, and poses of the processes and histories central to Diné weaving. Curtis Talwst Santiago (b. 1979 Toronto, Canada; lives in Lisbon) Over the last several years, Santiago has been creating dioramas inside of ring boxes. Inside of these small spaces, Santiago constructs environments that are intimate and performative; the artist has carried them around to show visitors one on one, opening up a scene in the space of his hand. 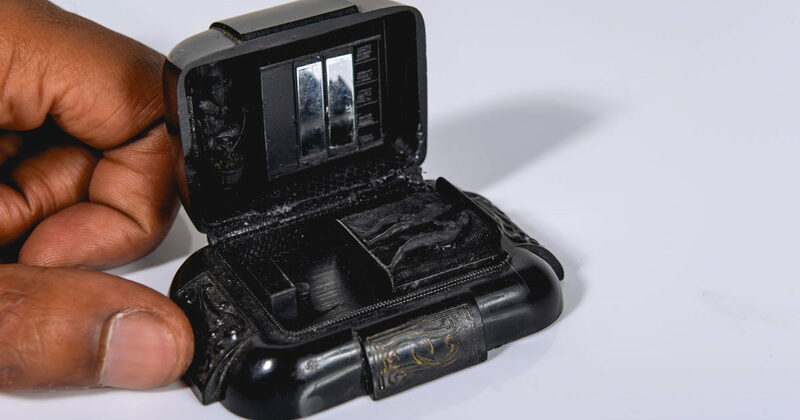 These mobile enclosures are a way of transporting carefully constructed scenes that include specific people, places, and histories. For Casa tomada, Santiago will create a glass house to collect and present a selection of the dioramas together in a singular installation. *Sable Elyse Smith (b. 1986 Los Angeles, CA; lives in New York City) Smith will present a new neon text work, along with a recent video, Men who Swallow Themselves in Mirrors (2017), which includes found and created footage examining constructions of masculinity and violence, featuring intimate video and audio messages sent to the artist from her father who is incarcerated. *Stephanie Taylor (b. 1971 New York; lives in Los Angeles) Partially taking over SITE’s institutional voice, Taylor is recording a number of songs/press releases for Casa tomada, which are posted to the exhibition’s website, and also distributed via emails and postcards. In the most recent one, Press Release #2, Taylor bombastically announces the participant artists in the biennial. 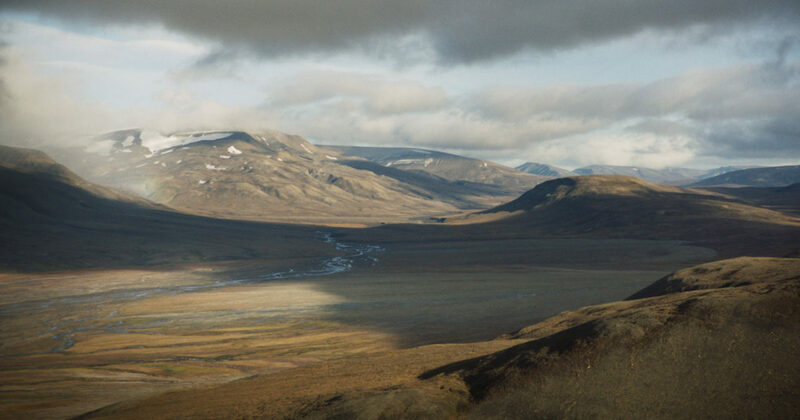 In the galleries, the artist will present Miraculous Fermentations, a new video installation in which she explores the connections among landscape, foreign accents, and legibility. Lawrence Paul Yuxweulptun (b. 1957, Kamloops, Canada; lives in Vancouver, British Columbia) Yuxweulptun will present paintings and a series of new totemic sculptures that address the appropriation of Indigenous aesthetics by modernists artists, while at the same time, speak to ceremony and spirituality, land ownership, and Canada’s treatment of First Nations peoples. José Luis Blondet (b. Caracas, Venezuela; lives in Los Angeles), Curator of Special Projects, LACMA, Los Angeles. Candice Hopkins (b. Whitehorse, Yukon; lives in Albuquerque), Independent Curator, Albuquerque. Ruba Katrib (b. Baltimore; lives in New York), Curator, MoMA PS1, New York. With significant experience across the Americas, the team is supported by Curatorial Advisor Naomi Beckwith, Marilyn and Larry Fields Curator at the Museum of Contemporary Art Chicago, and by the curatorial team at SITE Santa Fe, Irene Hofmann, SITElines Director; Brandee Caoba, Assistant Curator; and Joanne Lefrak, SITE Center Director. To feel the anxiety of authenticity. To invent others as well as the self. To deviate and to align. To be the host or the proprietor. To be the guest or the trespasser. The first artist project of the exhibition is a commissioned song by Stephanie Taylor (USA) a Los Angeles-based artist who explores the relationships between sound and objects, creating musical works amidst installations, which connect various subjects within newly constructed narratives. For SITElines.2018, Taylor has formulated the first press release into a song. She has enlisted a chorus of five vocalists to highlight underlying vowel sequences and repeating sounds within the text of the press release. The resulting song delivers accurate information about the biennial through an unexpected combination of institutional promotion, language play, and other communication strategies. Following Press Release #1, Taylor will record additional songs that announce aspects of the exhibition, which will be issued leading up to and throughout the run of the exhibition. At the closing event, Taylor’s songs will be performed in a live concert. SITElines.2018 Curators presented a talk about the upcoming exhibition on March 23 at SITE Santa Fe. Click on the screen below to watch the video to learn about their plans. 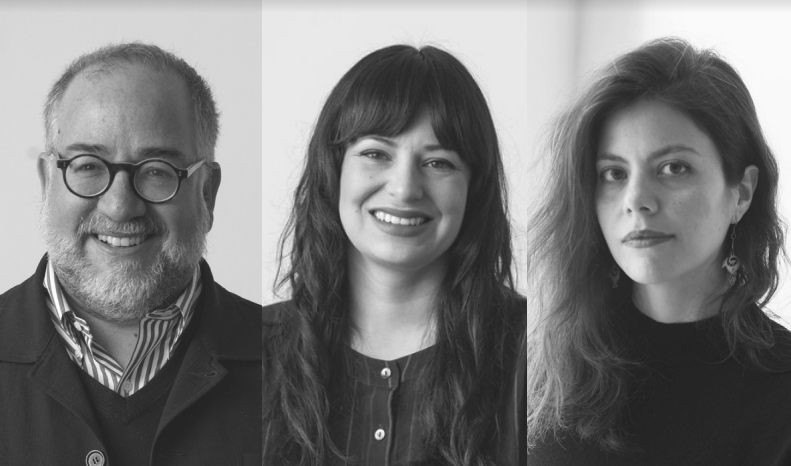 The SITElines.2018 team has engaged the graphic design studio Venezia-Bronk to design a microsite that hosts information and artwork related to the biennial. Launching in fall 2017, the site is an essential component of the exhibition and will create a continuous connection of feedback between its physical location, time-based programs, and content produced specifically for the Web. The platform will provide early details about the show and ongoing information about programming and events, and will function as a digital repository for commissioned texts. Click on the logo below to visit the microsite. Andy Cushman, Blue Medium Inc.
SITElines is a radical rethinking of SITE Santa Fe’s signature biennial exhibition. When SITE Santa Fe opened in 1995, it launched what was then the only international biennial of contemporary art in the United States, and one of only a handful of biennials around the world. In the over 20 years since, the landscape of the international contemporary art world has expanded, bringing a proliferation of biennials worldwide. The exhibition is made possible in part through generous support from The Andy Warhol Foundation for the Visual Arts, Avalon Trust, Thornburg Investment Management, the SITE Board of Directors and many other generous foundations and friends. Support for the Canadian artists in the exhibition provided by the Canada Council for the Arts, which last year invested $154 million to bring art to Canadians throughout the country. Additional support is made possible in part by the City of Santa Fe Arts Commission and the 1% Lodgers Tax. 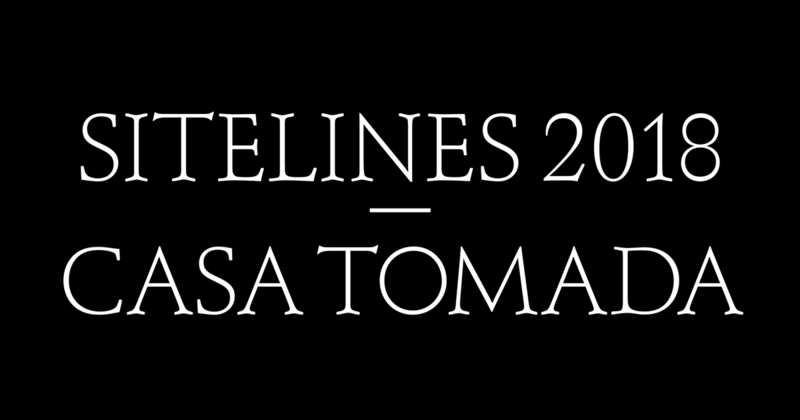 SITElines.2018: Casa tomada is Curated by José Louis Blondet, Candice Hopkins, Ruba Katrib and Naomi Beckwith.